Milano Monuments was presented the Best Small Monument award in a national design competition sponsored by the Monument Builders of North America this past month. The award was won for a memorial designed on a boulder with a sawed, polished front featuring hand etching. Milano Monuments of Cleveland, Ohio won the “Best Small Monument” award for this entry in the Monument Builders of North America’s 2012 National Design Contest. "Milano Monument's award winning monument was judged on elements of proportion, balance and the story the monument coveys." Milano Monuments won the Best Small Monument award in Monument Builders of North America’s (MBNA) 2012 National Design Contest this past month. The award was presented at a recent Joint Annual Meeting held in conjunction with the California Monument Association (CMA) and the Pacific Northwest Monument Builders Association (PNMBA) held at the Bahia Resort and Hotel in San Diego, California. 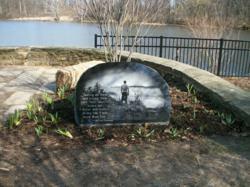 For their Best Small Monument entry, Milano Monuments designed a boulder with a sawed, polished front that matched the natural setting for the placement of the memorial by Shaker Lakes in Shaker Heights, Ohio. The hand-etched scene produced by Milano’s reknowned artist, Peter Viyuk, depicts the deceased at the top of a mountain he had climbed before his passing. His favorite poem is on the left. The design was judged on elements of proportion, balance and the story the monument conveys.